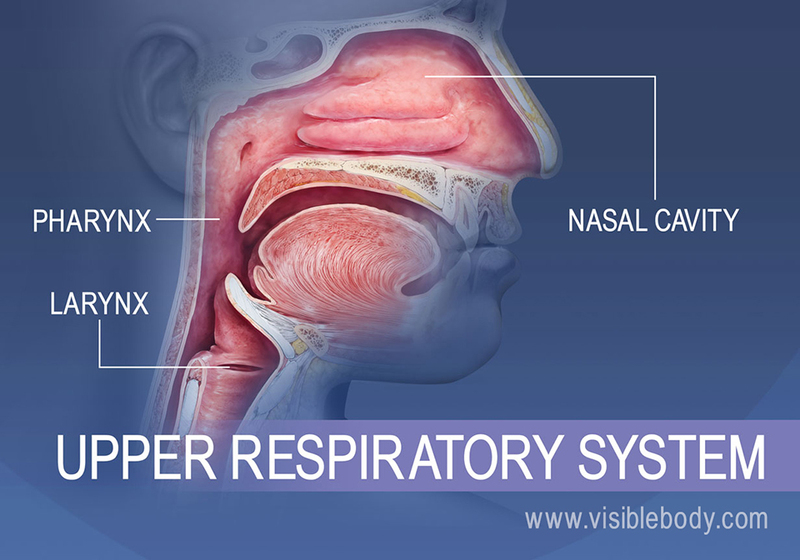 The upper respiratory system, or upper respiratory tract, consists of the nose and nasal cavity, the pharynx, and the larynx. These structures allow us to breathe and speak. They warm and clean the air we inhale: mucous membranes lining upper respiratory structures trap some foreign particles, including smoke and other pollutants, before the air travels down to the lungs. The nasal cavities are chambers of the internal nose. In front, the nostrils, or nares, create openings to the outside world. Air is inhaled through the nostrils and warmed as it moves further into the nasal cavities. Scroll-shaped bones, the nasal conchae, protrude and form spaces through which the air passes. The conchae swirl the air around to allow the air time to humidify, warm, and be cleaned before it enters the lungs. Epithelial cilia (commonly called “nose hair”) and a mucous membrane line the inside of the cavities. The cilia, along with mucus produced by seromucous and other glands in the membrane, trap unwanted particles. Finally the filtered, warmed air passes out of the back of the nasal cavities into the nasopharynx, the uppermost part of the pharynx. 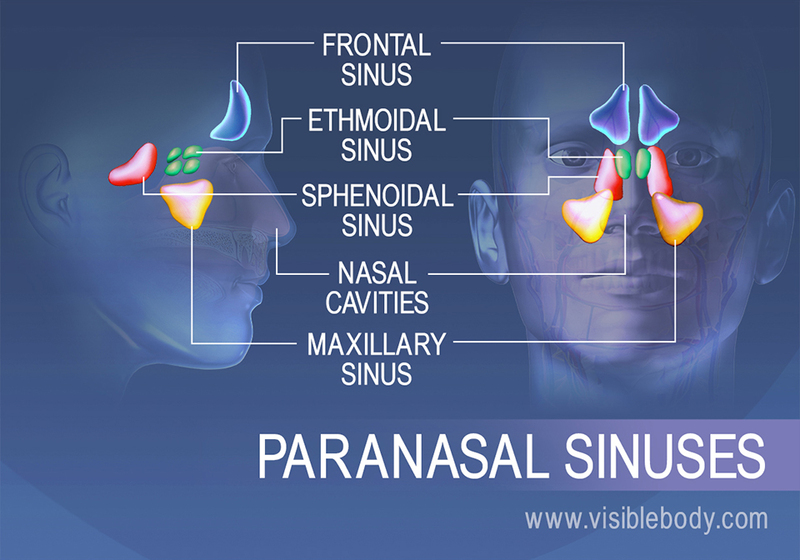 The paranasal sinuses are four paired, air-filled cavities found inside bones of the skull. These sinuses are named for the skull bones that contain them: frontal, ethmoidal, sphenoidal, and maxillary. 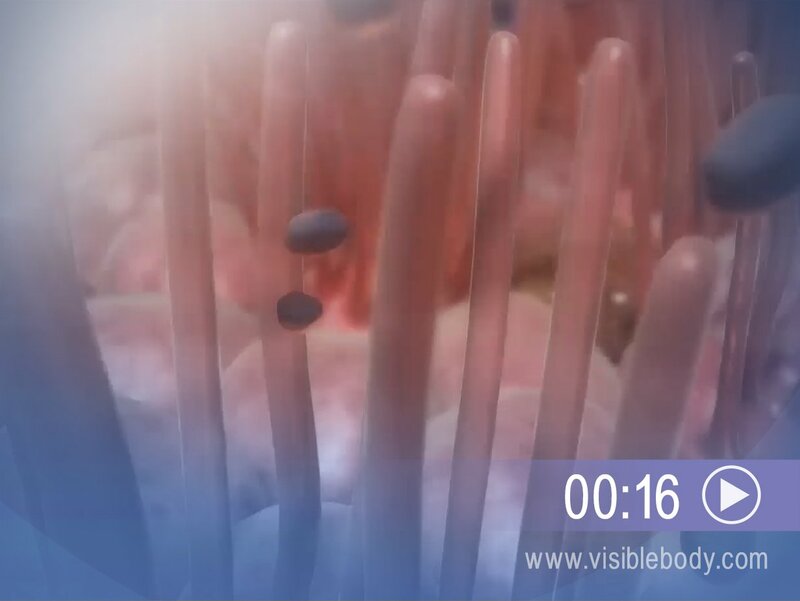 Mucosae line the paranasal sinuses and help to warm and humidify the air we inhale. When air enters the sinuses from the nasal cavities, mucus formed by the muscosae drains into the nasal cavities. The pharynx, or throat, is shaped like a funnel. During respiration, it conducts air between the larynx and trachea (or “windpipe”) and the nasal and the oral cavities. The pharynx includes three regions: The nasopharynx is posterior to the nasal cavity and serves only as a passageway for air. The oropharynx lies posterior to the oral cavity and contains the palatine tonsils. 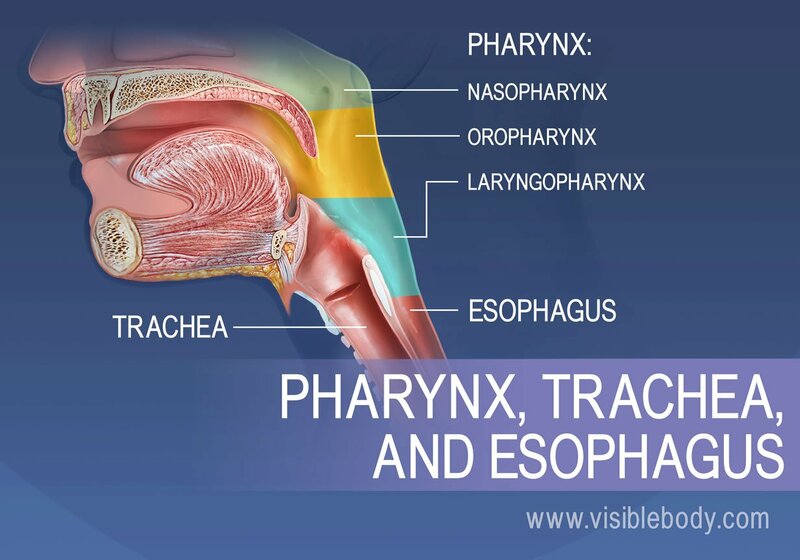 Both air and ingested food pass through the oropharynx and through the laryngopharynx below. The laryngopharynx lies posterior to the epiglottis and connects to the larynx (superiorly) and the esophagus (inferiorly). As we breathe, the epiglottis stays up and air passes freely between the laryngopharynx and the larynx. The larynx connects the lower part of the pharynx, the laryngopharynx, to the trachea. It keeps the air passages open during breathing and digestion and is the key organ for producing sound. This larynx is comprised of nine cartilages. One, the epiglottis, is a lifesaver: Located on the posterior side of the larynx, the epiglottis closes like a trap door as we swallow. This action steers food down the esophagus and away from the windpipe. Inside the larynx are the vocal folds (or true vocal cords), which have elastic ligaments at their core. When we speak, yell, or sing, air coming up from the lungs and trachea vibrates the folds, producing the sound. The U-shaped hyoid bone, located just under the chin, is an important contributor to both respiratory and digestive processes. 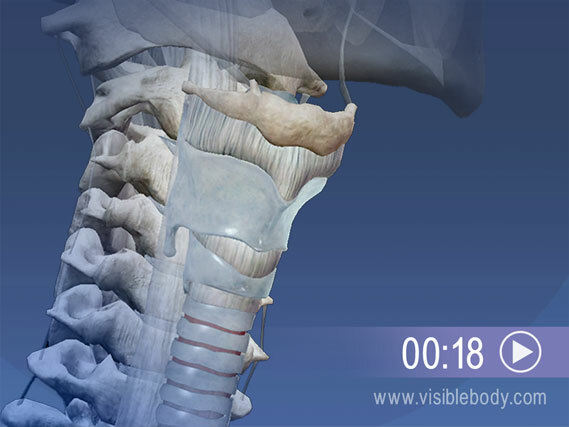 The hyoid is attached to the tongue, and helps you to swallow at the start of digestion. 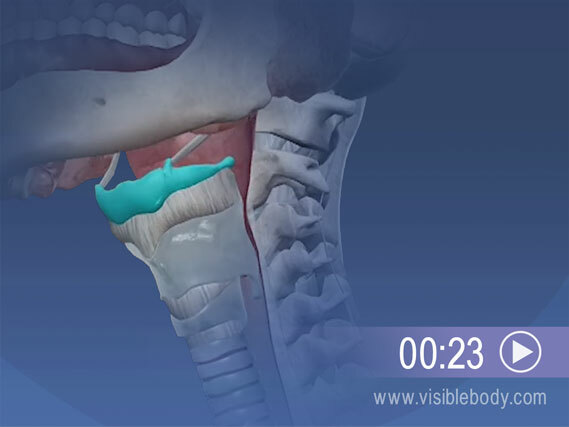 In the respiratory system, structures that produce sound depend on the hyoid. The body and the greater horns of the bone serve as attachment points for neck muscles that raise and lower the larynx during speech (as well as during swallowing). A description of the pharynx from the 1918 edition of Gray's Anatomy of the Human Body.